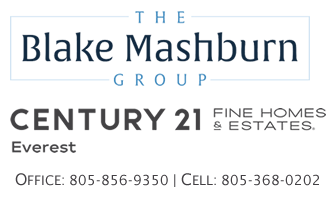 Blake Mashburn is recognized as one of the most respected and productive Realtors in West Ventura County, California. Since 1990, Blake has built his success on four guiding principles: integrity, knowledge of the marketplace, understanding his clients’ needs, and a strong work ethic. Blake joined Century 21 Troop Real Estate, now Century 21 Everest, in 2008 and has been recognized as the top-selling, top-volume and top-listing agent for the company's Ventura office since. In addition to local recognition, Blake is consistently ranked among the top producing real estate professionals nationally. Blake's success, however, is not based solely on sales figures. Blake thrives on matching the right buyer with the perfect home, as well as exceeding home seller's expectations. Blake's ability to understand the needs of his clients and his keen negotiating skills, combined with his over 26 years of full-time real estate experience, create the foundation on which his success is built. Blake holds the designation of Graduate, Realtor Institute(GRI) which equips him with in-depth knowledge of technical subjects, in addition to the fundamentals of real estate. His credentials also include certification as a Short Sales and Foreclosure Resource (SFR) and Certified Distressed Property Expert (CDPE). In addition, he serves as a Director with the Century 21 Everest's Fine Estate & Homes division. Blake serves the West Ventura County real estate market including Ventura, Camarillo, Oxnard, Port Hueneme, Fillmore, Santa Paula, and Ojai. If you are considering buying or selling, Blake would welcome the opportunity to serve you. Your #1 Choice for West Ventura County Real Estate… Since 1990!